Anthropologists, sociologists, philosophers, economists and activists have come together and written a citizen guide for a human economy. In The Human Economy more than 30 authors from 15 countries show alternatives to our current dominating economic system. 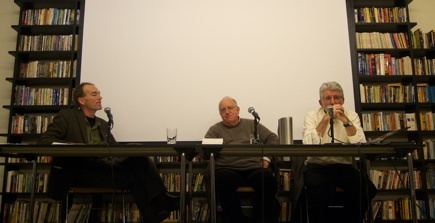 Anthropologist Keith Hart launched the book Friday last week in Oslo together with two contributors: Thomas Hylland Eriksen and Desmond McNeill. The table of contents looks promising: There are essays on for example solidarity economy, community participation, fair trade, ecological and feminist economics, alter-globalisation, social entrepreneurship and also articles on two topics that are especially relevant when we’re sitting in front of the screen: gift economies and digital commons. The problem with posting an radical alternative to the socalled capitalist economy is that it raises question how do you get there from where we are. What I want to argue is that the economies are much more plural than ideologies or conventional theories make them out to be. We live in a world in which we say if we can identify the economy as capitalist we’ve somehow done the job. Or if we want to build another one and call it socialist we’ve done the job. If we want to push the world economy in a new direction, then we should build it on what people are doing already - even if what they are doing already is marginalised, obscured or even repressed. Keith Hart made me think of what I wrote nearly ten years ago when I prepared my final exam in economic anthropology. The more I read about Kula, Potlatch and other gift economies in distant places, I wrote (in German only), the more I got convinced of that we are operating in a similar way, that capitalisms’ importance is overrated. I found lots of examples of local exchange trading systems, even in my neighborhood, that work without any money involved: You repair my bike, and I’ll help your with your English homework. The internet is a huge gift economy. Wikipedia, Flickr, blogging, we’re giving away our work for free. Or think of the free software movement or the way science works. Capitalism dominates only a small part of our economic system. This world is massively unequal and voices for human unity are often drowned. But now at last we have means of communication adequate to expressing universal ideas. Anthropologists and sociologists have shown that Homo economicus – the idea of an economy based on narrow self- interest, typified as the practice of buying cheap and selling dear – is absent from many societies and does not even reflect what is best about ourselves. We ought to be able to do better than that by now. But ideas alone are insufficient. Emergent world society is the new human universal – not an idea, but the fact of our shared occupation of the planet crying out for new principles of association. 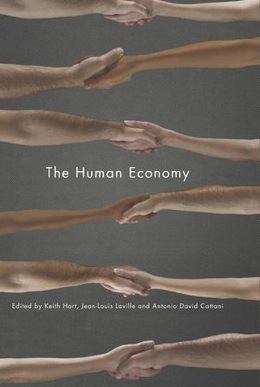 The Human Economy is a work of reference that has come out of a dialogue between successful social experiments in many parts of the world and theoretical reflection on them. The resulting synthesis is an invitation to advance knowledge along the lines we have begun and to dare to build a better world. Unfortunately, this “citizen guide” exists on paper only. I asked Keith Hart if a webversion is in the making. His answer was No. Lack of time. “I’m totally overworked", he said. I’ll try to write more about the book in the coming weeks.